The International Institute of Business Analysis publishes the Business Analysis Body of Knowledge (BABOK) Guide, which contains descriptive and prescriptive information on how to perform the activities and tasks of a business analyst in a number of areas of knowledge. The guide is produced and reviewed by a large number of people around the world and acts as a guide for business analysis, including requirements engineering. 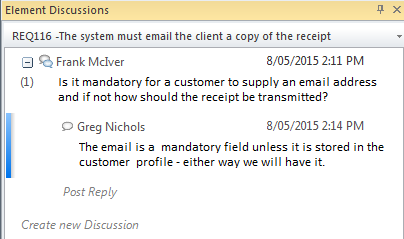 The guide defines a number of types of requirement, and these can all be implemented in Enterprise Architect by defining the types in the 'Requirements' section of the 'General Types' dialog. The Business Analysis Planning and Monitoring knowledge area is concerned with planning the approach to the analysis effort, the engagement with stakeholder, the governance of the activities and the how the Requirements and other information discovered during the process is managed and maintained. Enterprise Architect allows a team of analysts to define the approach that will be taken in the tool by defining processes, stakeholders and the governance mechanisms that will be used including the information that is collected. The Elicitation and Collaboration knowledge area is concerned with the discovery and conformation of information obtained from stakeholders and a variety of other sources. The collaboration with stakeholders during the entire requirements life cycle is critical to the success of the change or endeavor. Enterprise Architect has a number of tools that can assist with the planning the elicitation including a Project Calendar, Gantt chart and a number of team collaboration tools such as Model Mail, Element Discussions and Slide Shows. 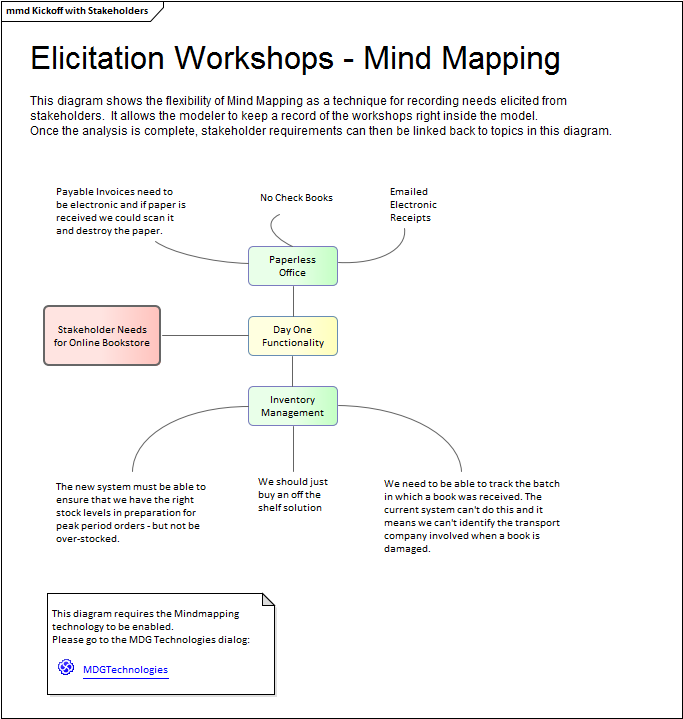 Information elicited during stakeholder workshops can be recorded using a MindMapping diagram and, once it has been analyzed, reports can be generated to a variety of formats for confirmation with stakeholders. Photos taken during user observations can be included in diagrams, creating a rich visual presentation. The Requirements Life Cycle Management knowledge area is concerned with the management of requirements and ensuring that the requirements can be related to the solution designs and ultimately to the solution components during the entire life cycle of the solution, from inception through to retirement. The management of requirements involves requirements governance, tracing the requirements, maintaining and prioritizing them and managing change and assessment. Enterprise Architect has sophisticated tools that enable requirements to be traced, maintained and prioritized. 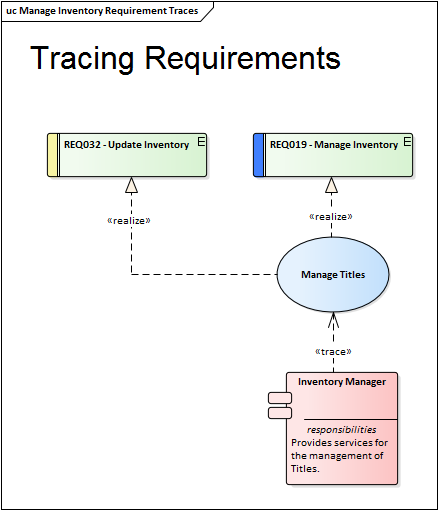 These include the Relationships Matrix, which can be configured to display sets of traces between source and target Packages; the Traceability window, which shows how elements are connected in the repository; and the Relationships window, which displays the relationships between elements in a diagram. The diagram is a powerful way to demonstrate and make visual underlying relationships including the connection between stakeholders and the elicited information. The requirements governance process could also be modeled using UML Activity diagrams or BPMN diagrams, and this process could be reused across a range of projects and changes. 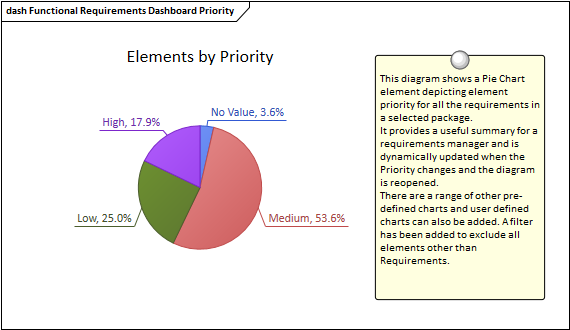 There is also a Dashboard diagram that allows Requirements properties to be categorized and displayed in a series of charts and graphs which assist in the collaboration and management of properties like Status and Priority and to communicate this information to stakeholders. The Strategy Analysis knowledge area is concerned with the discovery and articulation of a business need and the description of the future state and various transition (intermediate) states that will be used to move from the current state to the defined future state. It involves strategic thinking and the determination of a number of possible solutions that will create value for the organization and its stakeholders. Enterprise Architect has tools to describe the possible solutions and the value and outcomes they will produce and to model the current and future states and what is needed to transition from one state to another. 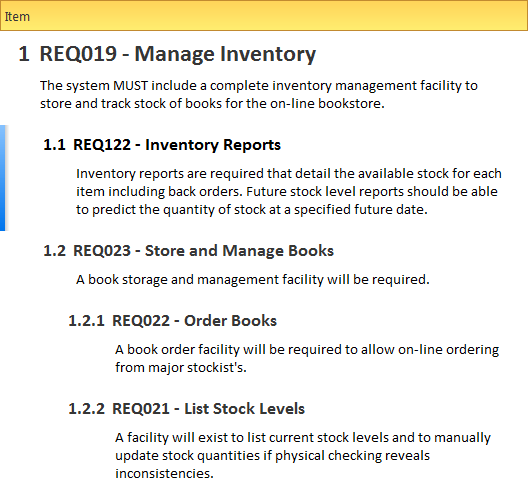 The Requirements Analysis and Design Definition knowledge area is concerned with how to organize and structure the information that is discovered during elicitation and how to record these as a set of coherent Requirements. It is also concerned with the prioritization of the requirements and finding solution options that can be evaluated against the potential benefit they will bring to the business. The articulation and evaluation of solution options is done in conjunction with the implementation teams but ultimately it is the business analyst that is responsible for conveying the options and their business value and recommending a solution to the stakeholders. Enterprise Architect is a fully featured requirements management tool and allows requirements to be created, maintained and prioritized. 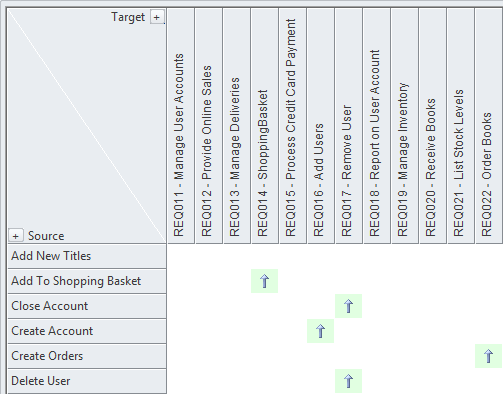 The Specification Manager can be used to input, maintain and visualize requirements in a view that resembles working in a word processor or spreadsheet. The Solution Evaluation knowledge area is concerned with the evaluation of an implemented solution and the assessment of whether it meets the business needs. 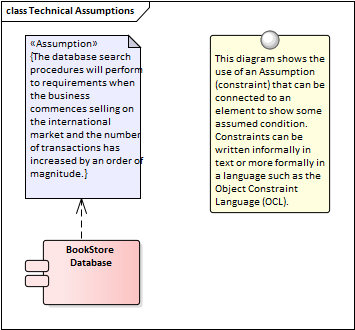 The implementation is typically a partial solution or proof of concept and the analyst must work to determine if there are obstacles or removable constraints that are limiting the value that can be delivered by the solution. Enterprise Architect is a full life cycle tool that not only is a requirements management platform but also allows the modeler to describe the solution in detail including constraints and design decisions and rationales. The solution components can be traced back to the functional, stakeholder and ultimately business requirements allowing the analyst to visualize the solution in the context of the problem and to record issues and decisions that will help inform how to proceed with a change.